FROM LOCK OUTS TO DOOR ARMOR WE HAVE YOUR HOME SECURITY NEEDS COVERED! 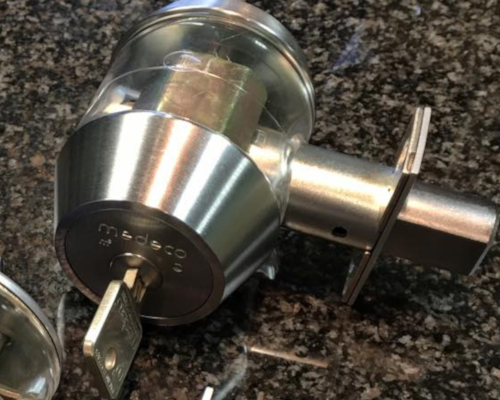 Are you sick and tired of locking your keys in your house? Or perhaps you constantly lose your keys? Our world class team members specialize in providing Solutions to these types of problems. We would love to install a keypad lock to your door so you never have to worry about missing keys again! Our expert technicians can quickly and easily help you regain access to your domicile. Want to up your security at you home or residential property? 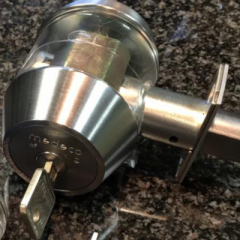 We can install the ultra high quality Medeco deadbolts to really give you piece of mind. Proven to stop intruders from being able to force entry into your home. Reinforcing the strength of your door around the lock and frame makes it nearly impossible to Kick In. Do you frequently lose your keys? With an electronic keypad you don't have to worry, simply type in your code and you're in! 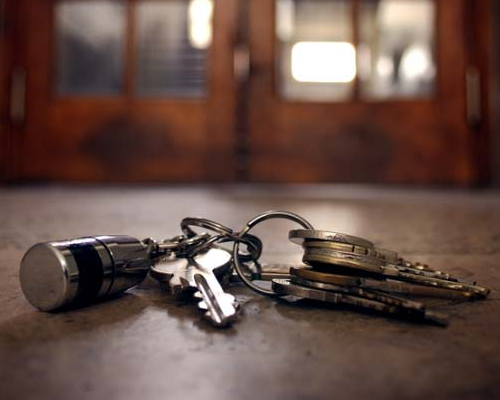 If you are constantly losing your keys and getting locked out of your house, we can offer a solution for your problem. It may be time to call us about our beautifully crafted keyless entry locks. Utilizing the latest in bluetooth technology, these locks are a functional and fashionable way to gain entry in your home using only your smart phone. You’ll never have to worry about your house key, and you’ll never lock yourself out again! AT LOC-DOC SECURITY WE HAVE TECHNICIANS ON STAND-BY 24 HOURS A DAY, 7 DAYS A WEEK TO HELP YOU REGAIN ENTRY TO YOUR HOME. 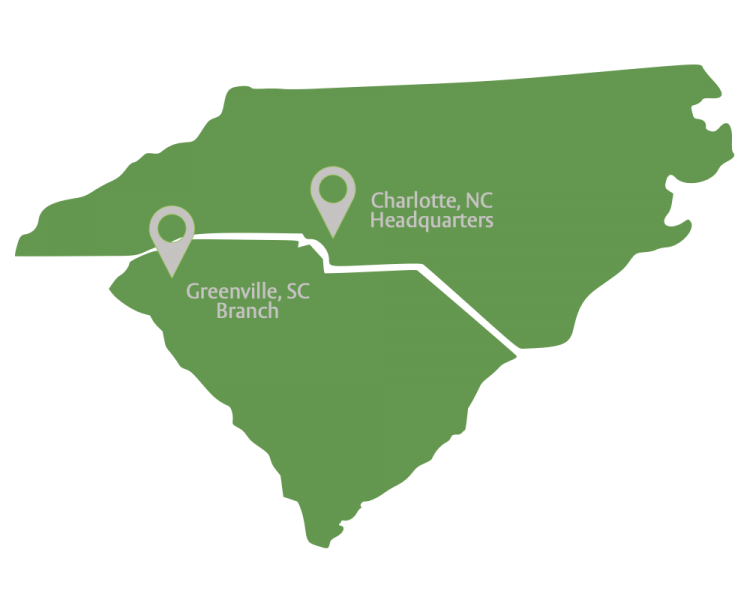 Our normal business hours are Monday through Friday from 8:00 A.M. to 5:00 P.M.. Most Lock Outs occur outside of these times. That is why we have a rotating “After Hours” schedule. Whether is is 8:00 P.M. on a Thursday or 3:00 A.M. on a Saturday night, we got you covered. All of these scenarios are easily remedied by giving Loc-Doc Security a call. Our after hours technician will be there in a hurry and help you to regain entry into your home. If you need a new key cut, we would be glad to help with that as well. There is however another option. All of these scenarios share the same common issue, a lost key. At Loc-Doc Security, we love providing forever solutions. In this situation, we would recommend a keyless lock. You can’t lose a passcode! We can also install ultra sleek, high-tech bluetooth locks that you can open with your smart phone. There is no such thing as “Too Secure” when it come to protecting your family and your home. Not only are our High Security Deadbolt solutions pick-proof, they are built to last and have a sleek finish (matched to your specifications of course). Worried the baby sitter may make a copy of your key? Here at Loc-Doc Security, we have a patented keyway that only we can duplicate. Using our state of the art data management system, you can rest easy knowing that we will never duplicate your key unless you request one. INSTALLING A HIGH SECURITY DEADBOLT IS A GREAT WAY TO PROTECT AGAINST INTRUDERS AND GAIN CONTROL OF YOUR KEY MANAGEMENT. I want to loan a key to the baby sitter, house sitter, nannie, etc., but I am worried that they may make a duplicate of my key. I wish that our deadbolt felt more secure. Too bad our current deadbolt is not as sleek as some of the ones I have seen at other people’s houses. Okay, time for some honesty. Cosmetics aside, the key duplication issue is the main reason people go for High Security Deadbolts. Not sure what we’re referring to? Check out this video made by account manager Kevan Starr. You can rest easy knowing that Loc-Doc Security is the ONLY place you can get your key copied, and only if you are on the list of approved people to receive said key. We own the patent to the keyway to your lock! This means that the key cannot be duplicated by a duplication kiosk, or even another lock smithing company. In addition to this, if someone brings your key in to make a copy, we can notify you (or the police). All of our key records are kept safe on our state of the art cloud base data management system. Add this to the list of Forever Solutions. High Security Deadbolts also pair nicely with some of our other residential solutions, such as a Door Armor kit or a Keypad. Still not convinced? Give us a call and we would be glad to come on site and provide a thorough assessment of your current security solutions. Door Armor is used to reinforce the weak points on your existing doors. By reinforcing the frame, hinges, and area around the lock, it makes the door nearly impossible to kick in. It is also a great solution for door repairs. This is a huge value add to any installation and a relatively easy DIY project. 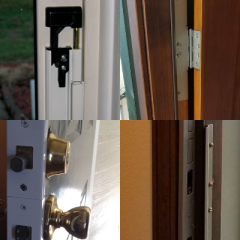 UTILIZE DOOR ARMOR TO GREATLY INCREASE YOUR SECURITY AT A LOW COST. 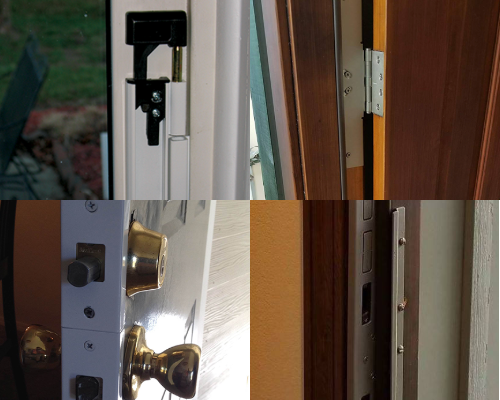 Our Door Armor solution protects against Home Invasion. For most people, locking the deadbolt is sufficient and gives them peace of mind. If someone is trying to break in, they must first get through the lock, and if our High Security Deadbolts are installed on the door, this is no easy task. But what if the burglar decides they want to kick your door down? It turns out that even with a high security deadbolt, if the door frame is weak, your door is still at risk, as it can easily be kicked in. This is where Door Armor comes in. Door Armor works by reinforcing the weak points of your existing doors, as well as the frame itself. In other words, it provides additional strength to your door opening to prevent forced entry. Our Door Armor is available with multiple options, such as hinge reinforcements, and even alternative finishes to match your door and frame. Whatever your needs are to reinforce your door opening, we’ve got you covered. At Loc-Doc Security, we love installing wonderful products on peoples openings. We also understand that not every solution is for every customer. Door Armor is one of the only solutions that we can confidently recommend as a Do It Yourself solution. 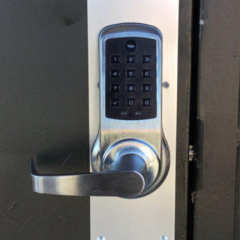 Keypads are an awesome alternative to regular keyed entry locks. 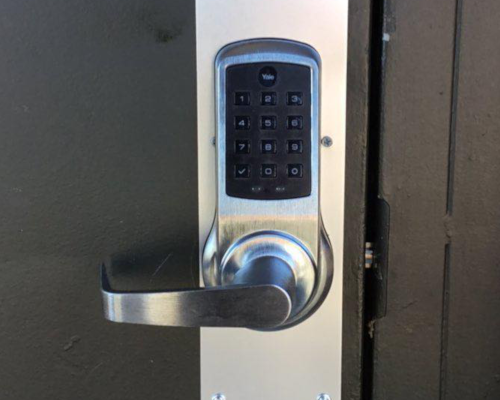 By utilizing a number pad and a programmed code, they allow you to unlock your door with a code. They are highly secure and can be utilized along with a high security deadbolt to really up your security. Keypads also give your home a more modern look, if that is your thing. 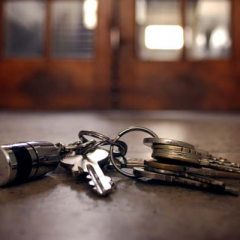 STOP CARRYING AROUND AN EXCESSIVE NUMBER OF KEYS AND GET A KEYPAD LOCK INSTALLED. Nowadays everyone has heard the term “Smart Home”. It refers to having your air conditioning, lights, music, refrigerator, and everything else in your house automated. Go ahead and add your door locks to the list by installing an integrated touch screen keypad. Keypad locks are a great way to lose your keys, for good. Not having that extra set of keys in your pocket feels kind of nice. Especially when you realize that you will never be locked out again. There is something oddly satisfying about typing in a code to enter your code. Just push a few buttons, listen to the sound of an expertly engineered lock retracting from your door frame, and then step into your home. Loc-Doc Security stands behind all of its installed products. If you don’t believe me, just ask owner Chad Lingafelt, who happens to have a Yale Assure Keypad Lock installed on his front door.